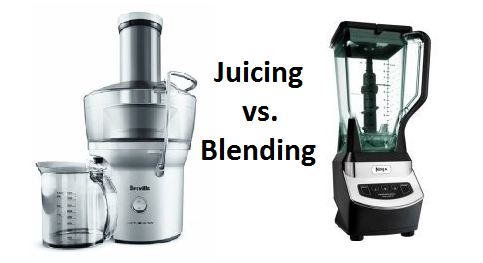 ere are the key differences when it comes to juicing vs. blending. Although both really are things you could and should add to your daily diet, they do offer different benefits and once you understand these, you can then come up with your plan to incorporate each into your everyday lifestyle. Juicing will provide with the quickest and best way to get the nutrients you need while blending will give you fiber. But, there are other ways to get that fiber, whereas juicing is the BEST way to get those nutrients. Juicing is the method of extracting juice, and only juice, from vegetables and fruits. All of the pulp and fiber are removed, which allows the nutrients to assimilate very quickly into your body and bloodstream – this gives your immune system an immediate boost and feeds your cells quick, healing nutrition. When you juice, you can drink the nutrients of TONS of fruits/vegetables in one glass, since the pulp/fiber is left behind. I have made juice with 3 full heads of kale, which is way more than I could ever drink in a smoothie. Your digestive system also gets a break because there are no solids to break down. The juice that hits your bloodstream, undigested, within minutes most times (like coffee), is what truly has nutritional healing powers once your body has adjusted to it. Can you EAT this much as a smoothie everyday? Not me. For example, take a look at an average size of a plate of what I juice on a daily basis to the right. There is NO WAY I can eat that much greens at once, where I can drink this in a 32oz. mason jar with no problem, and my body can handle this because it is in pure liquid form and does not require any digestion. To digest this amount of fiber, would expend a lot of energy as well as take several hours, and at the end of that I would not have received as much in nutrients as I did by drinking this juice. Now let me talk about blending for a minute, as I do that as well, but for different reasons. The reason most people blend and use products like the Vitamix or Nutribullet is because the makers of these have done a great job marketing them and getting the word out that they are very easy to use and easier to clean. This is all true, and again, I am not saying that blending things and making shakes or smoothies is bad for you, but again, they will require your body to have to fully digest them before the nutrients reach your cellular level, which will be 3-5 hours later and also diluted due to the process of digestion. They also talk about retaining all of the fiber when you are blending, and this is true as well, but remember when your digestive system is working properly and not "clogged" so to speak, then the role of fiber is not as needed because you are moving things through your system well enough on your own. Fiber does do a good job of making you feel full, and for a lot of people that are trying to lose weight, adding a few fiber rich smoothies to your diet throughout the day will help you stay feeling full for longer, and ideally help you lower the total calories that you are taking in, which will then help you lose weight. But, EVERYDAY JUICING is what this site is all about, and that is what I did to achieve the health benefits that I did and lowering my cholesterol by 66 points in 4 months. That came from adding JUICING to my EVERYDAY lifestyle, and not blending. All berries are great for using to BLEND and make smoothies! With all this being said, I do also use a blender to make smoothies, and normally I do this in the mornings when I take the pulp from my juice that I made the day before (it is fine in the fridge for 1-2 days), and combine 2 scoops of that with 1-2 scoops of protein powder, maybe some chia seeds, maybe some hemp, and water or almond milk, and drink that smoothie in the mornings. Now, you are getting the best of both worlds.